Lately, it seems as though the Macaron Gods have been smiling down on me. It seems I've got the temperamental macarons down pretty well now. I haven't have a failed or unsatisfactory batch in a pretty long time. After countless trays of misshapen, lopsided feet, deflated, or cracked macarons, I would say it's about time! Of course, now I've jinxed myself. So I could attribute this great achievement to a sudden blessing from the gods, but more realistically, I would say there are logistical reasons for my success. 1) I still age my egg-whites. At least 24 hours. Preferably 48. I have gotten over my fear of un-refrigerated egg whites--after a few exquisite macarons, my mom has also gotten over her doubts. 2) I always WEIGH out all my ingredients on a kitchen scale. 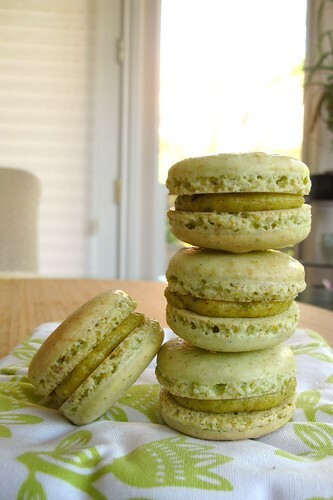 I see macaron recipes that call for ingredients by cups, tsp, tbsp, etc and I just cringe. They're just setting themselves up for disappointment and disaster. 3) I can now recognized exactly when to stop folding the batter. That probably helps a lot. 4) I still let the piped shells sit out for about 20 minutes, or until the batter is no longer sticky when you gently touch the top of a shell, before putting them in the oven. 5) I bake one tray at a time. I could probably get away with baking both trays at the same time, but I'm paranoid about which tray gets which oven rack. 6) I discovered our oven at home is a convection oven. I'm pretty embarrassed to say that although I've been using that same oven for over 5 years, I have just NOW discovered it's a convection oven. Using the convection bake function of my oven as allowed for more even heat distribution and has helped immensely with the development of beautiful feet on my macarons. I would say this is the most recent and most influential reason for my success. 7) Because my shells are coming out of the oven looking beautiful, I've started putting more thought into what I want to fill them with. Before, some would come out less than perfect, and I would get too discouraged to even come up with a great filling. 8) Letting them "mature" overnight in the refrigerator after filling the shells is also crucial. This allows the shells and the filling get to know each other, which leads to a texturally more satisfying and cohesive macaron. I think that's all the newfound wisdom I have to bestow on anyone else who has a macaron obsession like me. I can't say I'm completely satisfied with the macarons I'm now producing, but I'm definitely getting closer. 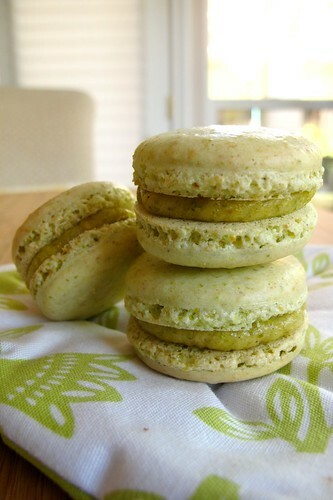 These Pistachio Frangipane Macarons are some of my latest creations. I accidentally piped them a little larger than I'd prefer but they were pretty tasty, if I do say so myself. The shell had a delicate, crisp outer crust that easily gave way to a chewy, moist interior filled with an intensely pistachio frangipane filling. However, it was still a little on the sweet side for me. 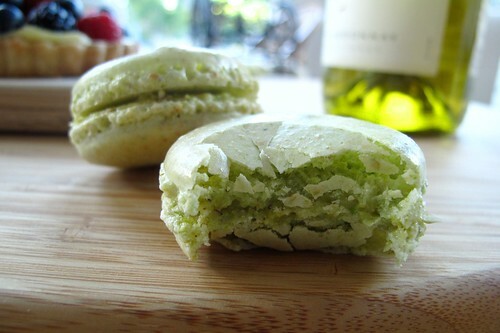 I'm still waiting for the day when I'm brave enough to tweak macaron recipes a little more. 1. Combine butter, sugar, almonds, pistachio, and egg in the food processor and pulsed together until it makes a paste. 2. Add flour in at the end and pulse to combined. 5. fold the dry ingredients into the meringue in two installments. I wish I could tell you exactly when to stop folding, but this part really just takes experience. Fold until the ingredients are just mixed in and you can no longer distinguish meringue from dry ingredients--I guess the best description is still "molten lava"
very nice!!! I have Ludo's recipe for macarons so I'm going to experiment with that... his utilizes an italian meringue, so you actually don't have to worry about overwhipping it. and yes, it's a good idea to let the shells get a "skin" before putting them in the oven. Wow. I am so impressed! Those look better than most of the ones you see in the bakeries around town! Thanks for all the tips! Ok, i have a slight little crush on.. er.. your macarons. Look at these guys, they look so perfect! And pistachio is one of my favorite flavors so it's double the fun. Nicely done! wow looks so good! I would like to buy some xD if you have any leftover! 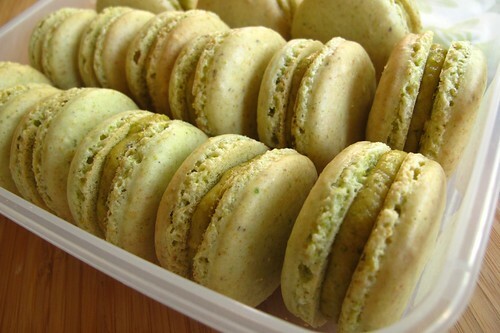 Pistachio macarons are my faaaaavorite. My favorite macaron at Gregory Renard- the patisserie I mentioned- is the pistachio, and my all time favorite dessert is the gallette des rois, which is filled with frangipane. My two favorites in one beautiful bite! I love macarons, but I've been so afraid to try them! Thanks for your tips. I plan on attempting them soon. Already bought everything I need. oh wow i'm so impressed! those look really yummy....go get your own kitchen asap! Over sweetness is a huge problem with many "dessert" recipes in America, and mostly only in America. That said, I can't eat macarons without coffee/milk nowadays. You should do something about that... like.. sell low sugar versions? Piping 'em bigger than 1/2" is no problem here! I'd eat it, no matter how many bites. I find macarons a little too sweet a lot of times too. However, they're so temperamental already, it's difficult to adjust the sugar level without completely changing the texture and ending up with something other than a macaron. I just try to make my fillings less sweet.